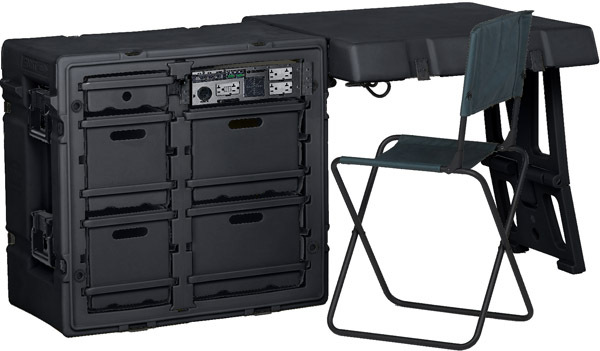 New or existing Tactical Desks can be equipped with a Global UPS, which are easily installed by replacing the drawers. These power drawers are shaped to duplicate the drawer format including the side drawer glides and front locking hasp. By replacing the drawers, we are able to equip new desks quickly or retrofit your pre-existing Tactical Desks with ETI's tactical power equipment. The top left drawer holds a 500 VA UPS and the top right drawer holds a 1000 VA UPS. 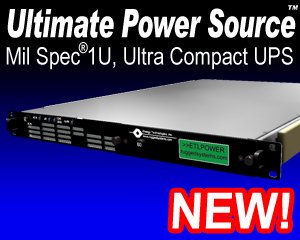 Each Global UPS takes either global AC and/or vehicle DC in and outputting 120 VAC, 60 Hz (220 VAC, 50 Hz optional) to GFCI protected outlets. Control and circuit protection is via guarded push/pull aircraft-style circuit breakers eliminating the need for fuses in the field. The LEDs provide a quick status including load level and battery level plus feature a dimmer for situations requiring less illumination. These units feature air flow specially designed to work within the confines of a drawer's space and still stay cool. 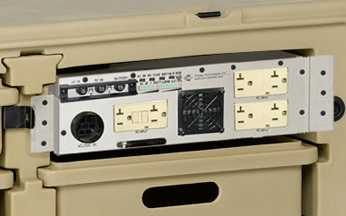 When ready to move to another location, the UPS remains mounted in the desk and the desk folds into a shipping cube.